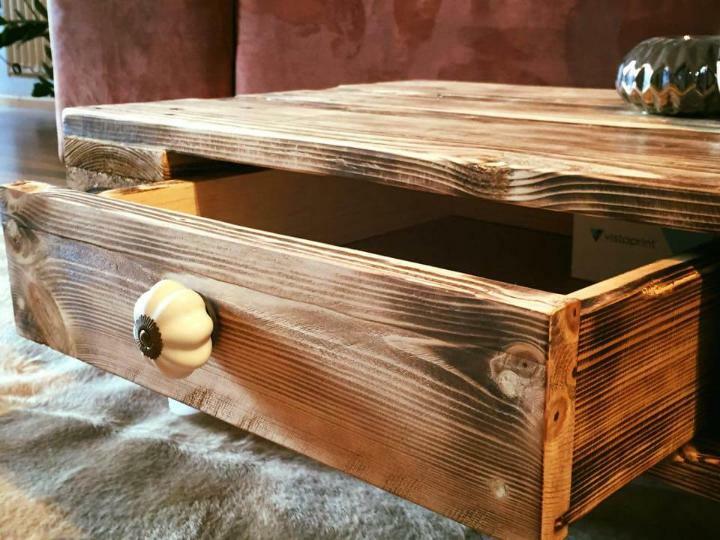 Explore there the jaw-dropping physical pallet operations here that lead to dominant pallet furniture crafts of your choice! 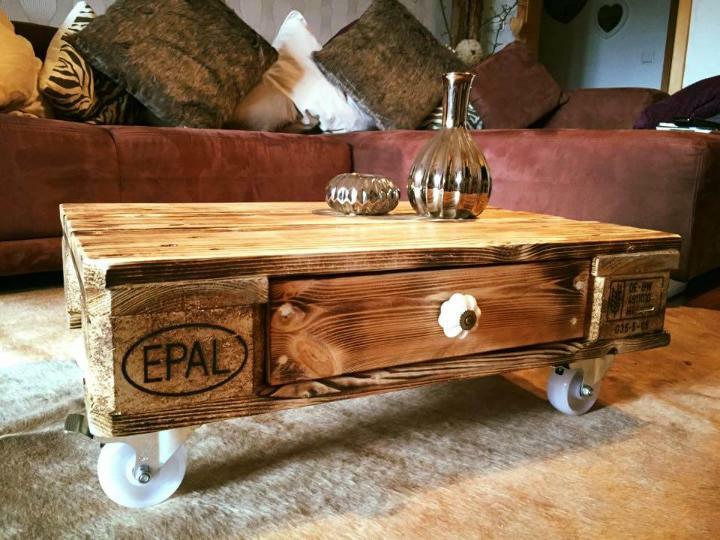 There are different options to go handmade with pallets for some fab furniture achievements like you can use the pallets as they are, can modify them a little, can extend them with external apparatus and can deconstruct them totally! 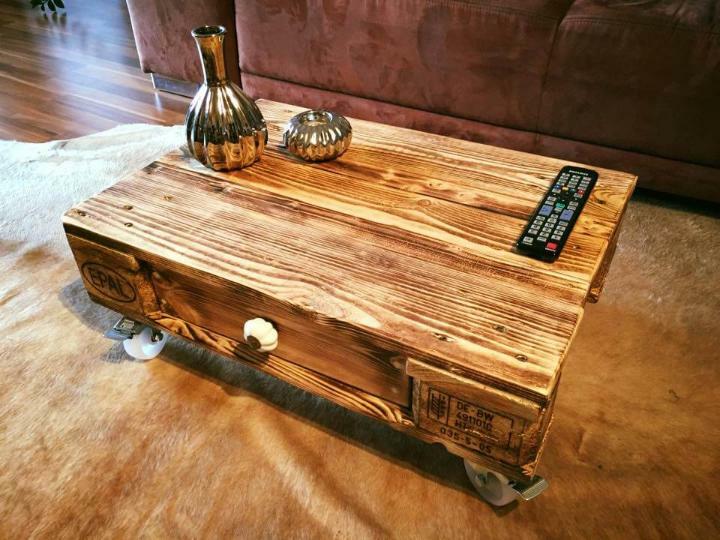 Checkout this one unique DIY pallet coffee table design having caster wheels at bottom, this brilliant achievement has been done by readjusting and altering a one pallet board only! Wheels have been fixed on pallets chocks which serve here as already made short legs to this pallet table! One drawer has also been installed just to secure or hide some personal tools, magazines and even the mobile phones! A white antique knob has also been fitted to drawer for easy opening and hence the whole shape becomes aesthetically pleasing and super functional as well! Table can be display in variety of colors using paint and can also be stained or burned for an inspiring antique look! 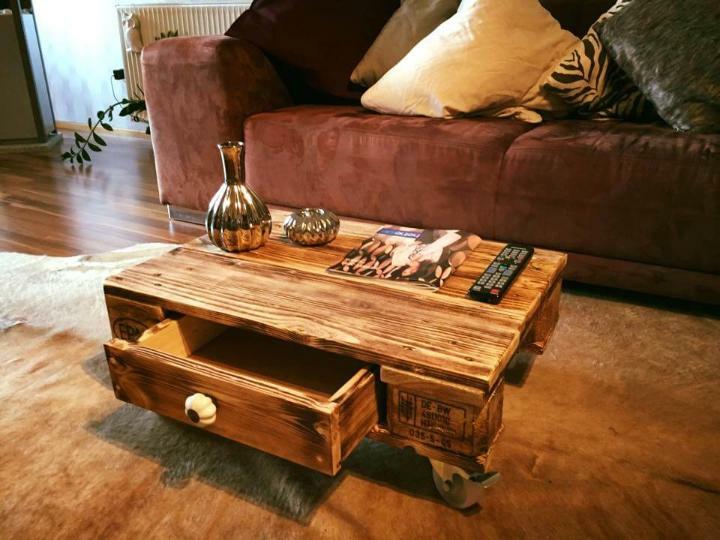 Look here some pleasurable tasks to do with pallets, manage a pallet board to build a coffee table for you and we are sure that it would take much of your time! Get an EPAL pallet boards or any other having in reach and copy this super functional inspiration of coffee table! The pocket in pallets haven been given a drawer fill and faster rolling movement has been created by installing caster wheels to bottom of the table! An antique white knob has been fixed at front of drawer and look like a white flower, this makes the drawer-opening really easy and give a accentuates the overall design more! Table has been got into dominant rustic look and by going through a wood burning process and you can also target the paint, stain and white to create a distinguished modern or shabby chic look of table!